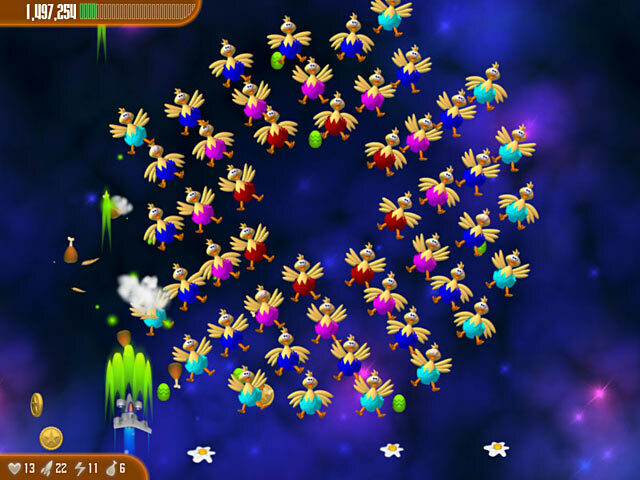 Chicken Invaders 3: Revenge of the Yolk Easter Edition is rated 4.8 out of 5 by 5. Rated 5 out of 5 by roarupgames from Hilarious and FUNNY !!!!!!!!!! This game is awesome i love it.I played this game at my friends house and it was really funny and hilarious that's why i came to the internet and searched this awesome game.From above all the games i had played i rate this .......... A BILLION STARS !!!!!!!!!!!!!!!!!!!!!!!!!!!!!!!!!!!!! I really recommend this game.Trust me it is the best ! Rated 5 out of 5 by sivo40 from FUNNY :D WHY people dont play this game is beyond me its funny and it is quite hard to complete ! Rated 4 out of 5 by sereneorchid from Never enough lifetimes The one thing that has kept me from purchasing the Chicken games is their insistence that once you lose your 5 lives, you have to start over at the beginning. Why? There's only so many times you want to play the same levels over and over. So there goes a ratings star. 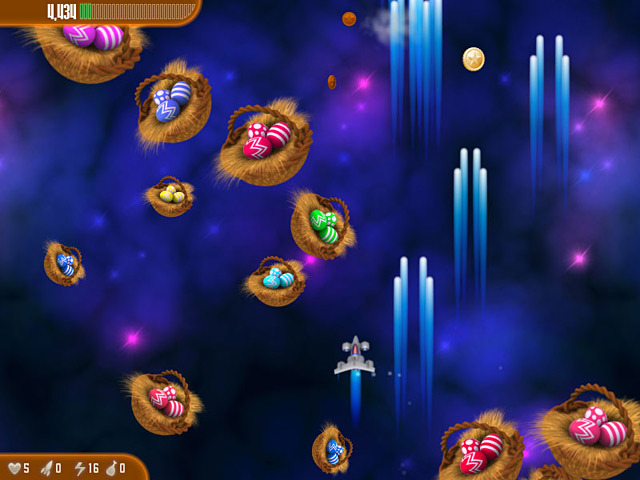 You start the game by giving the Easter bunny a hotfoot, and there are additional Easter touches throughout, like an "asteroid" belt of Easter baskets. But actually I was disappointed that the flying chickens weren't "laying" colored eggs, just all green ones. 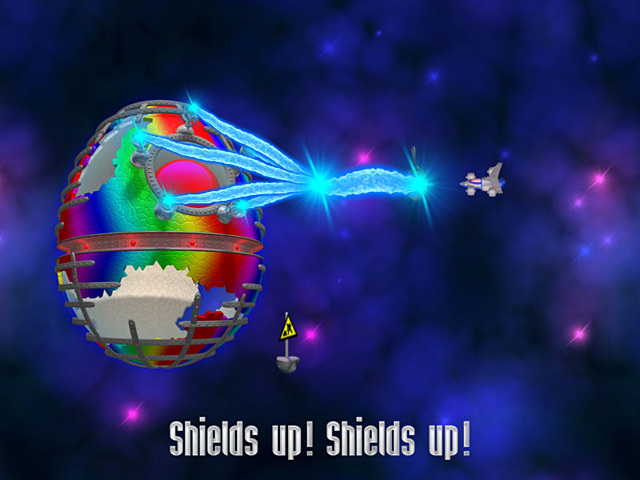 If you haven't played a Chicken game, it's a spaceship shooting game, and your opponents are space chickens. It's a funny premise and storyline, with outstanding graphics. However, the instructions are "yolk-free," so I'll help you out. Avoid the falling eggs, as they'll take a life off of you, and not due to cholesterol. As you blast chickens, fried chicken legs, roasted chickens, and chicken burgers will fall from the sky. Be sure to run your space ship over as many of them as possible for points. Also do the same for falling packages and power-ups, which will increase your firepower. I got hung up three times by the same Unidentified Flying Chicken spaceship with megawatt power, and couldn't face the frying pan from the beginning again. Developers, give all of us a fighting chance, and offer various safe levels to continue the game from instead of restarting at level 1. Not everyone has the time or patience to replay the same levels multiple times. But if you choose to keep trying, I discovered that you can use the space bar to space through the intro story. Also, I find the mouse 100x easier to use than the keyboard for maneuvering the ship and aiming the laser. Happy chicken burgers! 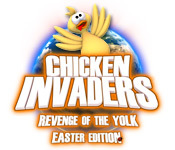 Dash across the galaxy to save Easter from the latest chicken threat in Chicken Invaders 3 – Revenge of the Yolk Easter Edition!